Audience is based directly on the individual webshops customer behaviour. 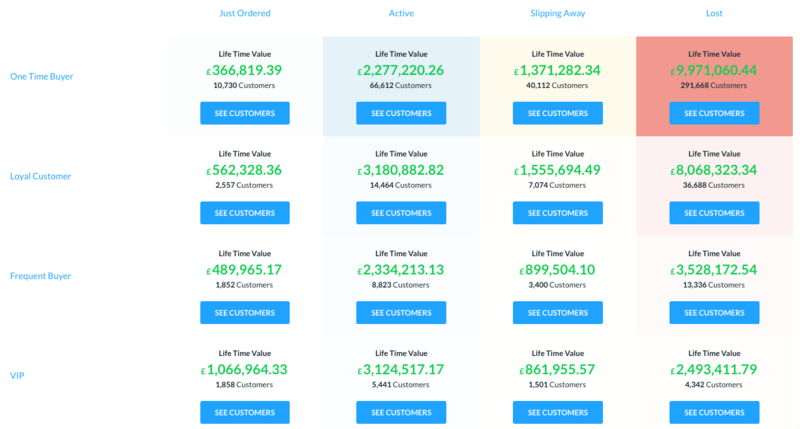 Each metric is measured dynamically which means that the groups depend on how all customers are behaving based on all the order data available to Clerk.io. As such, the split between when a customer is Loyal and Frequent, might change over time, depending on how often customers purchase in general. This is one of the best metrics of Audience. Through customers' purchase history, Clerk.io can anticipate which customers will be likely to purchase the products, brand, type of products etc. that you choose. If Clerk.io sees that many customers buy a blue pair of shoes with a red shirt, then customers who have purchased the red shirt will show up if you find customers, who are Interested In "blue shoes". Even though the algorithm is much more advanced than this, the point is the same. Lets you find customers who have already purchased a specific product, from a specific brand, category etc. Lets you find customers who have not yet purchased a specific product, from a specific brand, category etc. These customers purchase the very most from you, They place the most orders, and buy for the largest amount in your webshop compared to other customers. These customers buy quite frequently from the webshop, compared to the average customer. These customers come back regularly to your webshop, but not as often as Frequent Buyers. These customers have only placed 1 order in the webshop. These customers placed an order recently, most likely within a couple of days. These customers regularly come back to the webshop. The timeframe of how often they come back, is based on how often the average customer places an order. These customers are purchasing less often than the have previously done. If a customer normally places 3 orders each month, but suddenly only places 1 order a month, they are Slipping Away. It has been so long since these customers placed an order, that they are very unlikely to come back, unless you reactivate them. Find customers based on how many orders they have placed. Find customers based on what their average order value is. Select a specific date or timeframe in which customers must have placed an order. Select a specific date or timeframe in which customers must have placed their very first order in the webshop. Select a specific date or timeframe in which customers must have placed their last in the webshop, and haven't come back since.